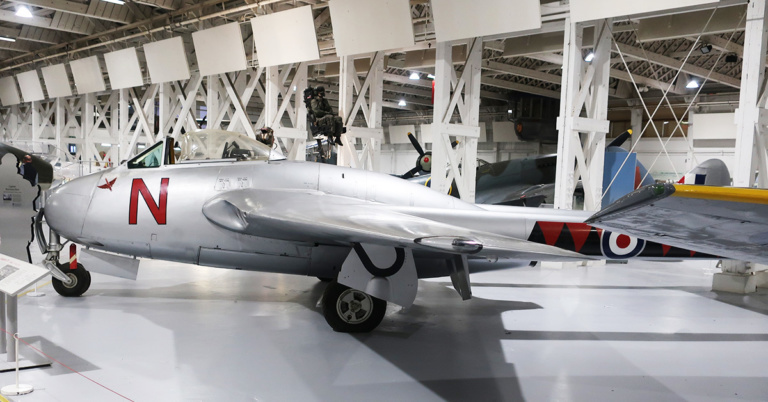 This is pictures of several different versions of the de Havilland Vampire, one of the first operational jet fighters in the world. If you want to learn more about the Vampire read about it on Wikipedia. The planes here are both the original single seater ant the later twin seater versions from different museums around the world. Building the de Havilland Vampire in 1/48? There are three base kits (with new tooling). Hobbycraft issued a Mk.I in 1993 that has later been released in different version later. In 2005 Classic Airframes released a Mk.V and has since released several versions also as the double seater version. Trumpeter released a Mk.IX in 2013 which has been re-released as a Mk.V later. The only one I have built is Trumpeters kit and it is quite simple, for the experienced builder I'd recommend some after market detailing kits to this kit.